Construction Job site restroom trailers. Whether it is outdoor events or commercial construction We develop a comfortable and sanitary portable toilet restroom rental option for the outdoor facilities industry. In order to do this We follow strict OSHA guidelines. Your commercial site tells us about your portable toilet restroom needs. We use great customer service to keep you informed about portable toilet rentals at the job site. Asking the right commercial site questions to give the proper recommendations of a portable toilet restroom. We don't just specialize in luxury portable bathrooms. Needing to go to the bathroom is one of our most basic things of course! According to OSHA’s 29 CFR 1926.51, “lavatories shall be made available in all places of employment.” This practically always goes without saying. But, in mobile and outdoor places of work, especially with construction sites. Sometimes having enough available toilets requires further guidance for job sites and large events. 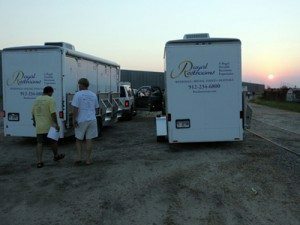 Our portable restroom trailers rental meet this requirements. OSHA 29 CFR 1926.51 standard further lists requirements for non-flushing toilets placed outside. We utilize the standard as a base and rent nothing less. The minimum number of available lavatories depending on the amount of workers at the site for your portable bathroom rental. In a example, if there are 20 or less workers, only one portable toilet rental is required. IF there are more than 20 workers, 1 portable toilet seat restroom and 1 portable urinal per every 40 workers. But When there are more than 200 employees 1 portable restroom with a toilet seat is required. This OSHA standard is required in the United States. But some states use a voluntary consensus standards recommend more stringent guidelines for portable toilet restrooms. Others stating hand and a eye washing station unit is required. trailers. We also offers emergency planning assistance to organizations that are integrating portable bathrooms into their existing or developing plans. This can be also for those dealing with disaster relief and meet all ada compliant issues. David Sauers, Jr., head of the Royal Restrooms Emergency Response Team, is recognized nationally as an adept and trusted industry consultant. His knowledge ranges from advisement to businesses and private and government emergency management agencies including FEMA. He is also a media industry spokesperson on national and international disaster situations. In many cases, portable bathrooms can be placed on retainer at a reduced cost. Emergency service delivery is guaranteed any where in the contiguous United States within 24-48 hours of a confirmed agreement. Construction sites have a lot going on and there is always time lost when waiting to use a porta potty rental. The Difference is some of our portable trailer Restrooms actually have running water and a sink. Hand washing can be vital avoiding issues if someone has chemicals spilled on their hands and face. We Strive to be compliant with all guidelines and even thinking of the worst so you don't have to. Even in areas with out electricity or water we can service. We also have for cold or hot climates some of our luxury portable toilet units have air condition and heating. Running water and or shower units available making hand washing and dealing with chemical contamination easy to deal with. Heating and cooling units available powered by generator or 120V outlet, Great for all climates in summer and winter.